May 14th was my first Mother's Day without my mother. She's been gone nearly 8 months now, and I was told the "first" of every holiday would be the hardest. I've spent pretty much every Mother's Day with her over the past decade, so I knew I had to do something special. I considered visiting her memorial site, but figured that wasn't something I was ready to do yet. Instead, I sought out something to take my mind off her absence -- as if that were even possible -- and happened upon CycloFemme. "What is CycloFemme," you ask? According to their website, it is "a Global Celebration of Women created TO HONOR THE PAST from the shoulders of those who stood before us, for the freedom to choose and the chance to wear pants. TO CELEBRATE THE PRESENT with strength and courage, voices raised, moving together. TO EMPOWER THE FUTURE of women everywhere, the backbone of positive social change." Anyone who knew my mother would agree that this is something she would stand behind and would definitely encourage me to take part in. The ride closest to me was hosted by Open Road Bicycles' St. Johns location. I was quite anxious about it being an emotional Mother's Day and worried about riding on the road while tackling my longest ever cycling distance, so it was a bit of a relief to know that I wouldn't have to add a lengthy drive -- especially while transporting my bike -- to my list of concerns. It was also nice that a couple Sheroes I knew from the Jacksonville chapter of BGDB and one of my Jacksonville Galloway Training friends would also be there. I arrived early to allow myself time to talk my anxiety down. As the rest of the group started to arrive, I put on my brave face and tried to be social. I thought I was doing a pretty good job until my Jacksonville Galloway friend arrived and gave me an extra long hug. She mentioned my Facebook post from earlier that month about how I wanted to fast forward to August and avoid Mother's Day, Father's Day, my dog's birthday (he died the day after Christmas) and the first anniversary of my father's death, to which I teared up and almost fell apart. After that, we were divided into two groups: the 25 mile group and the "Tour de Neighborhood" group, the difference being speed, as we would be covering different distances in the same amount of time. My friends and I were e received our ride instructions, discussed our route and learned that we would ride :gulp: in a paceline. Again, I had to talk my anxiety down. Although I saw cyclists in single pacelines on nearly a daily basis, this was my first group ride off the Rail Trail. Not only do I have to deal with cars, but I now have to ride in a paceline and lead at some point?! Thankfully, our ride leader had given us an out, so if our turn came, and we did not want to lead, we could just fall back to the end of the paceline. That took the edge off. Once, I learned we only had to lead for a minute or so, I was ready for the challenge. I sent the route to The Mr. and was ready to ride, "but first, let me take a #Selfie!" There was another group ride newbie, although, she was quite familiar with the route and rode it often on her own. We made a nonverbal agreement to stay together in the back of the pack, so when her chain fell off as the ride started, I stayed behind to help her get it back on. I started panicking internally, because no one in the group saw what happened, and I was afraid we would fall too far behind. Thankfully, the other group had not left yet, and their ride's leader had the presence of mind to tell me to catch up to the group and let them know she was still coming. I'd lost sight of the group at this point, but remembered the route, so I pedaled hard until I caught them just after a red light. I started to relay the message of our left behind newbie to the ride leader as she fell back to take her place at the end of the pack when, suddenly, there was a chorus of "slowing[s]," before our paceline scattered and came to a halt. It turned out that one of our riders had a flat tire, which gave us an opportunity to see an on site tire change. Ironically, I recognized the rider from a tire changing course we'd taken at Open Road Bicycles' Avondale store. After the quick, but informative, change, we headed back out on our ride. 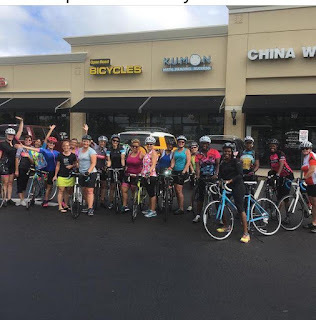 We ended up going 15 miles, -- my longest ever ride to date -- and, after we finished, I found myself going back out with a smaller, but faster, group who wanted more miles. I surprised myself a lot that day: Not only had I ventured way out of my comfort zone by riding on the open road, I also rode 30 miles in a paceline, and, when my time to take the lead came, I arose to the challenge and led for a couple miles. I think my mom would have been proud . . .